Bryanne Brown Nanfito, 70, of Hamden, went peacefully to her savior with her longtime companion by her side, on Feb. 20, 2018. 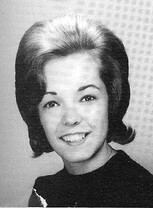 Bryanne, a lifelong Connecticut resident, was born in Meriden on July 10, 1947. The daughter of the late Bryant and Flora Dobratz Brown, she is survived by her two sons, Vincent III and Jeffrey Nanfito; four grandchildren, Morgan, Victoria, Arianna and Sebastian Nanfito; a sister, Claudia Brown West, two nieces, Kelley Roberts and Jennifer Murphy and Charles Hoff, her longtime companion. Bryanne, a published poet in her own right, was very active in the Connecticut/New York poetry community, serving as president of the CT Poetry Society and working on the Wesleyan Press. In addition, she obtained a Bachelor of Arts from Central Connecticut State University and studied Russian, via an accelerated program at Yale University, later utilizing her Russian language skills during several lengthy visits to the USSR. Bryanne was known for her infectious laugh and boundless enthusiasm. She will be dearly missed.